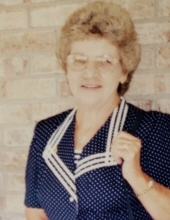 Lula Baker Neace, 82, River Caney passed away Friday, March 29, at the Kentucky River Medical Center in Jackson. She was the widow of the late Jerry Neace and the daughter of the late Kash and Mary Collins Baker. She is survived by three sons, Dexter(Ella) Neace, Jervis(Denise) Neace, Gerald(Jana) Neace; one daughter, Mary Ellen(Rodney) White; six grandchildren, Brenda Tincher, Jared Neace, Josh Neace, Katlyn Neace, Tim Neace, Isaac White; seven great grandchildren. Visitation, Saturday, March 30, 6:00 PM. Funeral Sunday, March 31, 1:00 PM with Rev. Mike Smith officiating. Burial in the Jackson Cemetery. To send flowers or a remembrance gift to the family of Lula Baker Neace, please visit our Tribute Store. "Email Address" would like to share the life celebration of Lula Baker Neace. Click on the "link" to go to share a favorite memory or leave a condolence message for the family.